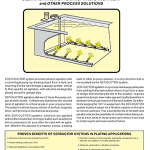 SERDUCTOR systems replace air and cathode rod agitation and provide solution agitation by using a pump to draw liquid from the tank and return it via an in tank manifold with eductor nozzles strategically placed and angled along the sparger pipe. 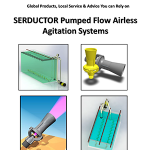 SERDUCTOR agitation amplifies pump flow to deliver 5 times the pump output at each nozzle and effectively distribute agitation to critical areas in your process tank. The system is available in a range of materials and can be driven by your choice of vertical, magnetic drive, self-priming or mechanical seal pump. Provides constant agitation because SERDUCTOR systems don’t clog. SERFILCO® International Ltd is a global supplier of liquid handling equipment for chemical, surface finishing and other wet process applications.